In the late 1800’s, shell collectors found and polished native North American clam shells. 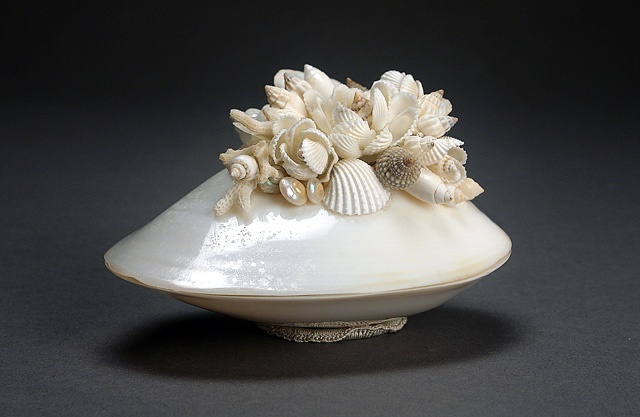 This clamshell is believed to be from the collection of Alfred Page who was also the captain of the steamship “Ellen Hardy,” which plied the Wisconsin River between Prairie du Sac and Portage. Alfred Page died in 1908 and his obituary states that “his collection of Indian relics, stalactites, rare stones and clam shells is said to be one of the finest in this part of the state.” Prairie du Sac News May 21, 1908. When the Sauk Prairie Historical Society deacquisitioned their collection of polished shells, I bought them and have begun to turn them into one of a kind containers that honor their beauty, fragility and historic significance. Each one is signed and dated. Shell Box 1 is in a private collection.